GIC is a prototype chat application that showcases a novel way to use Git. While the authors of Git probably expected frontends to be created for Git, they undoubtedly never expected Git would become the backend for, say, a chat client. Yet, that's exactly what developer Ephi Gabay did with his experimental proof-of-concept GIC: a chat client written in Node.js using Git as its backend database. GIC is by no means intended for production use. It's purely a programming exercise, but it's one that demonstrates the flexibility of open source technology. What's astonishing is that the client consists of just 300 lines of code, excluding the Node libraries and Git itself. And that's one of the best things about the chat client and about open source; the ability to build upon existing work. Seeing is believing, so you should give GIC a look for yourself. If you're hosting it yourself, create a centrally located bare repository. Each user in the chat must have an account on the server where the bare repository is located. You can create accounts specific to Git with Git hosting software like Gitolite or Gitea, or you can give them individual user accounts on your server, possibly using git-shell to restrict their access to Git. If you're not running Linux or BSD, follow the installation instructions on git-scm.com and nodejs.org. Wait for the Node modules to download and install. Assuming you receive no errors, you're ready to start chatting. When the client first launches, it must clone the chat repository. Since it's nearly an empty repository, it won't take long. Type your message and press Enter to send a message. A Git-based chat client. What will they think of next? 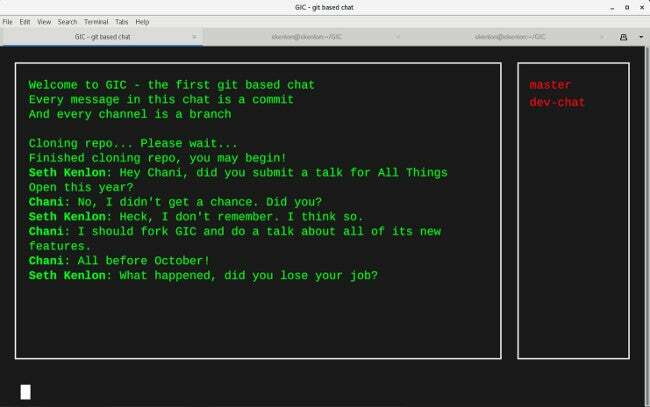 As the greeting message says, a branch in Git serves as a chatroom or channel in GIC. There's no way to create a new branch from within the GIC UI, but if you create one in another terminal session or in a web UI, it shows up immediately in GIC. It wouldn't take much to patch some IRC-style commands into GIC. $ git log --pretty=format:"%p %cn %s"
4387984 Seth Kenlon Hey Chani, did you submit a talk for All Things Open this year? 36369bb Chani No I didn't get a chance. Did you? GIC is a novelty. It's a great example of how an open source ecosystem encourages and enables creativity and exploration and challenges us to look at applications from different angles. Try GIC out. Maybe it will give you ideas. At the very least, it's a great excuse to spend an afternoon with Git. There is a typo in one of the commands. "git cone" should be "git clone". Thanks, Matthew! I've adjusted the typo. Oooh it would be neat to port this to isomorphic-git. Then it could run directly in the browser without a Node server. You have my attention! I hadn't heard of isomorphic-git before. I'll check it out, thanks for the tip!